Leather is the skin or hide of an animal, that is tanned making it more durable, then used to make clothing and other items such as wallets, leather jackets, gloves, horse saddles and messenger bags. The most common animal used to make leather is the cow. Other common animal hides include lamb, deer, elk, sheep, pig, buffalo, goat, ostrich, kangaroo, snake and alligator. 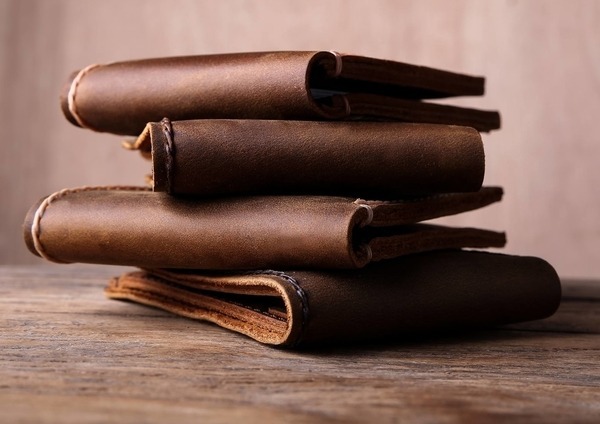 JooJoobs uses full grain distressed leather cowhide to make all of their wallets, belts and bags. Our leather ages like a fine wine, forming the most spectacular patina you'll ever witness. Below you will find complete answers to the most common leather questions. Both full grain and top grain leather come from the the top split of the hide. Full grain leather is more durable and resistant to wear. Sample of leather full grain leather is vegetable tanned and distressed leather. A typical top grain leather will have its surface buffed and sanded, both sides, then the leather surface will be further pigmented. Genuine leather is a made up marketing term used to deceive the general public. Bonded leather is glue, leather dust, scraps, plastic, vinyl and all bond together. Bonded leather is the lowest grade of leather used to make inexpensive items. Neither genuine leather or bonded leather contain the valuable grain portion of the hide. Both are created from the bottom split of the hide. Both genuine and bonded leather are heavily augmented and processed. The main difference between the two, genuine leather is 100% leather (lower quality) while bonded leather will also contain plastic and vinyl. Generally most people consider leather items that are 20+ years old, to be considered vintage. Vintage leather items will be made from either full grain or top grain leather. If you like the vintage look, but don't have the time to wait twenty years, consider items made from distressed leather. Leather does not like water and getting your leather products wet on purpose should be avoided at all costs. The number one quality to look for when shopping for a leather bag, is durability, especially at the bag's stress points. Look for manufacturers that pay close attention to ensuring their bags will stand the test of time. Our answer to this question, might be a little bit bias, just a tad, but we think our shop is great place to start in search for the best handmade leather wallets. Step 1: The most important step before applying leather conditioner to your leather goods, is to consultant the manufacturer of leather goods. Applying the correct conditioner, in the correct quantities is important to get the best results. JooJoobs distressed leather goods: I have great news for you. You don't have to apply leather conditioner to our leather goods. The distressed leather we use to make our handmade leather wallets is an oil leather. Everyday when you handle your wallet, your hands will actually be buffing your wallet with natural oils. Essentially, you'll applying leather conditioner everyday without even meaning to or knowing that you were. Step 2: Follow the instructions of the leather conditioner. Read the instructions on the back of the bottle. Step 3: When in doubt, apply sparingly. Less is more when it comes to applying leather conditioner. Our favorite DIY leather conditioner is coconut oil. If you live in a cold climate, you can substitute shea butter instead. Same as above, when in doubt, apply the oil very sparingly. Don't apply directly to the leather. We like to use a shammy cloth, apply drops of coconut oil and slowly rub circles into the leather. Try to rub an even quantity into surrounding areas. If one area is a little darker, that is ok, leave it alone, let is dry. Don't get caught into the apply more oil to match endless game. Do you best to apply equal amounts of oil into the leather and leave it alone, let is dry. Beeswax is probably the best DIY polish (water protectant) for leather. There are lots of youtube videos demonstrating this. Its not hard though, just buy beeswax and apply. I'd only polish shoes. Other leather products don't really need it. Leather will stretch naturally. i.e. if you purchase a JooJoobs wallet that has 4 card pockets and you put 2 cards into each slot, it will be a nice tight fit. But perhaps you want to add another card. You can jam the 3rd card into the slot, initially it will be very tight, but as you use the pocket, it will stretch and loosen up. But here's the kicker, that card slot, that you have stretched, will never go back to just holding 2 cards. Since you stretched to hold 3, it will now always have 3 cards. If you want to stretch leather straps, here is a good video demonstrating the use of water and rubbing alcohol. This article give 4 leather alternatives that a vegan friendly. Items made from high quality leather can last a lifetime. Products made from full grain leather that are properly cared for, could outlast their owners. So essentially, the higher the quality, the longer it will last. Items made from genuine leather or bonded leather are lower quality and will probably last only 6 - 12 months. The 3rd year wedding anniversary is the leather anniversary. So if you are a traditionalist, the gift you give your significant other on this special day, should be made of leather. Check out this article to learn more about the leather anniversary and for some awesome gift idea suggestions. Is a good question. So good in fact, we decided to write article on it. Here is an article detailing the seven most common leather engraving techniques.